When it comes to Southern Thanksgiving menu ideas, the hardest part is knowing where to draw the line and say “enough is enough”. We Southern ladies have a tendency to overdo it with family meals, especially at Thanksgiving! If you’re feeding a crowd of 20-30 people, you can definitely get away with a few meat choices and multiple side dishes, because you want to please everyone, right? My problem is, we usually only have around six for Thanksgiving. Madre and Jimmie come to my house, and we cook, and we feast. That’s not to say that I don’t like it…the only reason it’s a problem is because we can’t cook every single recipe that comes to mind when we’re just serving six people! Madre and Jimmie love to cook, as well, and once we all choose a recipe or two to make, we will have too much food for our small group. We always do. *This post contains affiliate ads, which means I may receive a commission if you purchase using the links I provided. All opinions are my own. When Coach and I first married, we decided to sort of “lay claim” to Thanksgiving. We visit family for pretty much every other holiday, and we wanted just one that we could host, so we could create memories in our own home. Once the girls came along, that became even more important to us. I invited all of our family members to our home that first Thanksgiving, and they all came! Everyone brought a dish, and we had such a great time. Coach’s Grandmother, Nanny, was still with us then, and she brought her famous chocolate meringue pie. Her chocolate pie was absolutely crave-worthy! Nanny would make Coach a chocolate pie any time he asked for one, and she also made us one every time I asked her for the recipe. The problem is, she never gave me the recipe! She would just answer my request with, “Oh, I’ll make you one! You can come get it tomorrow!” I later found out that Nanny didn’t have any recipes…she just knew how. I eventually played around with enough chocolate meringue pie recipes that I hit on one that was close to Nanny’s. I make one for Coach every year at Thanksgiving, and he’s always kind enough to say it tastes “just like ‘Ninny’s’”. I know better, but he sure is gracious. Nanny had no idea she was creating family holiday traditions that would last, even after she was gone. Jimmie and I usually have a few phone conversations to plan our menu. It is one of my favorite parts about Thanksgiving! How can we call it Thanksgiving without macaroni and cheese? Would it even be American to leave off even one of the many casseroles that we all love? We always start with a huge list of dishes that we just have to have, and over the next few weeks we whittle it down to something more do-able. It’s hard, I tell ya! 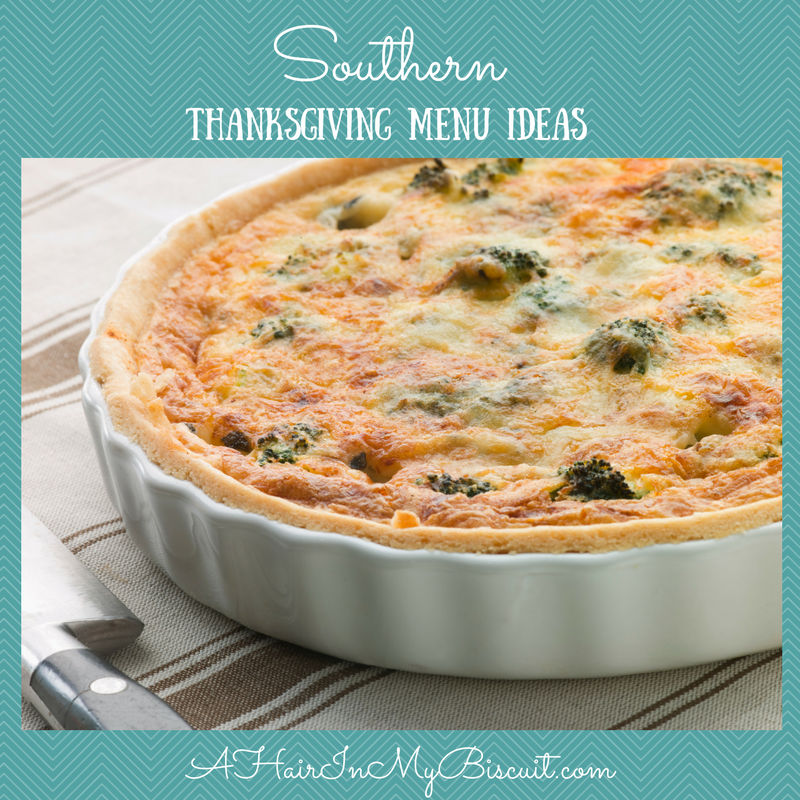 I’m going to share our plan for this year, and hopefully it will help you plan your own Southern Thanksgiving menu! Jimmie and I have nearly perfected it this year, and I am so excited to spend the day cooking with my Mom and my sister! We also have the advantage of having two kitchens on the property now that we’ve moved to Big Creek, since Madre’s house is 14 steps away, so we kind of wander back and forth between houses. It’s so much fun! photo (and recipe) borrowed from The Pioneer Woman. It has become a tradition to have an appetizer or two on Thanksgiving Day at my house. We always need something to nibble on to keep up our energy for all the cooking, right? This year, Jimmie has agreed to make her now-famous stuffed mushrooms for us to nosh on. I’m so excited! (They’re actually Ree Drummond’s stuffed mushrooms, found here). She recently made these for Daddy-O’s birthday dinner, and I’ve heard about them so many times that I must have some. I’m sure they’ll become one of our favorite Thanksgiving Day appetizer recipes. We’ll also have a tray of pickles and olives, because we always do. Sure, the relish tray could be on the table with the cranberry sauce, but somehow these little nibbles never make it that far, which is why I’m grouping them with the Thanksgiving nibbles! A relish tray is a staple on Southern Thanksgiving menus, with sweet pickles, bread and butter pickles, baby dills, black and green olives, and maybe even some celery stuffed with pimento cheese. Coach is going to want some of Jimmie’s yummy ham dip, but he’ll probably have to wait for Christmas. It’s a simple mixture of cream cheese, canned ham, and chopped scallions, served with some good crackers. You should definitely try it! It’s another of our Thanksgiving Day appetizer recipes, and it’s so easy to make! It’s really not a very specific recipe at all, just mix those three ingredients to suit your own tastes. We like it best with little thin wheat crackers (you know the ones). Yes, I said dressing. We don’t ‘stuff’ here in the South, we ‘dress’. This just means that A) the bread and sage dish is on the side, in a dish of its own and B) the main component of said bread and sage dish is cornbread, not white bread. Southern sage cornbread dressing is a very important dish in the South, and it has to be right…cornbread, turkey drippings, sage, boiled eggs, celery, onions, butter….all the good stuff goes in. Any other way is sacrilege. I roast my turkey in the oven with a whole stick of butter and few glugs of good white wine. It’s heavenly, y’all. I baste the bird with this delicious combo numerous times and it always comes out tender and moist with a crispy skin on the outside. I’m telling you, heavenly. It’s my favorite way to cook the bird, but I also love a good deep fried turkey. MMMMmmm-mmm…..if you’ve never had a whole deep-fried turkey, you must. As I said, the dressing is a dish all its own, and always my largest dish. I’ve made it the same way for my entire 18 years of marriage, and I’ll never change it. No oysters, no sausage, no weird ingredients… just delicious, Southern sage cornbread dressing. Much like Nanny, I don’t really have a recipe…I just wing it. It’s so much better that way! Yes, the turkey and the dressing are the main dishes. Just because dressing goes on the side does not mean it’s a side dish! The sides always include a(nother) starch or two, and a veggie or two, or some combination of starches and veggies. This year, we’ve decided (cautiously) to skip the mac and cheese and have my scrumptious broccoli rice casserole bake. It’s cheesy, creamy, and mostly green! I love this casserole, and I’ll share the recipe soon. Just so we can claim to have a healthy vegetable on the menu, and because they’re so freakin’ yummy, Jimmie is making her famous sautéed brussels sprouts with pecans. Oh my STARS, these are amazing! Pooh and Tigger even like them! If you’re not a fan of mixing nuts with your sprouts, check out Not Your Mama’s Brussels Sprouts for another method! Thanksgiving would not be Thanksgiving without Madre’s corn pudding and her luscious sweet potato soufflé. The corn pudding recipe can be found here (because I can’t reserve it for Thanksgiving alone), along with an easy baked green beans recipe (another menu idea!). This delicious, slightly-sweet-but-mostly-savory corn casserole is a must on our Thanksgiving table, and once you try it, you’ll agree. It’s simple to make, but it’s definitely a star on our Southern Thanksgiving menu idea list. The dessert course is quite possibly the second in importance only to the turkey and dressing. It gives us something to look forward to after the food coma wears off, and the flavors of Thanksgiving desserts are some of my favorites. We are straying from tradition a little this year. We usually have Jimmie’s pumpkin gooey butter cake, but we’ve decided against it for 2016. It’s leagues above regular pumpkin pie, and usually lasts for the entire week! Jimmie was kind and supported some kid in a fundraiser, ordering a cheesecake assortment tray, so we’ll be having that instead. I’m definitely ok with that! But, if you don’t have a cheesecake assortment tray coming, you’ll want to make the pumpkin gooey butter cake. It’s actually a Paula Deen recipe, but Jimmie is the nominated baker of this dish at our house, so I call it Jimmie’s. As you already know, I’ll be making a chocolate meringue pie for Coach. I might just make two…I love it as much as he does! I’d give you the recipe, but that just wouldn’t be fittin’. You’ll have to figure it out for yourself, just like I did (or you can click the pic above to get BHG’s recipe). Like many of you probably do, I have certain dishes and platters that are a MUST for Thanksgiving serving. Thanksgiving is so rich in tradition for most Southern families that even the preparation utensils are the same each year. I can’t make my dressing without my enormous Tupperware bowl. The turkey must be served on my cute little turkey platter that I bought years ago. My fancy egg plate that I inherited from Papa’s mother, Gran, always comes out for the deviled eggs. I also break out my pretty gravy boat, and I always sweet talk Madre into making the gravy. Do you have your own Thanksgiving traditions that you just cannot stray from? What is your favorite dish? I’d love to hear all about your Southern Thanksgiving menu ideas, or even your Northern ones, Western ones, heck any ones! It’s so fascinating to me that there are so many different customs in America, and how strongly each region feels about its Thanksgiving food choices! School me on your way, because you never know…I might just give something new a try! Happy, Happy Thanksgiving, from the Biscuits to you! May your turkey be succulent and your DRESSING be cornbread! We forgot to assign the deviled eggs!! Madre? Well, duh! I love hers! Love, love, love this entry. Thanksgiving is my favorite holiday and we too are trying to lay stake to it. This will be our second hosting. I’m very much looking forward to having gathered at OUR table again! Have a great turkey day! Hold on tight! It’s so wonderful to have that one holiday that we don’t have anywhere to be but home!